At 10am on Wednesday 23 December 1953 the S.S Gothic berthed at the port of Auckland, and our monarch, ‘Elizabeth the Second, By the Grace of God, Queen of New Zealand and Her other Realms and Territories, Head of the Commonwealth, Defender of the Faith’, stepped onto New Zealand soil, the first and only reigning monarch to ever do so. Just like at Coronation time, it was a good time to be in the souvenir business, and many a souvenir pen and pencil was sold. Unfortunately it seems that most of them were not exactly the good stuff. Rather they were just the ordinary everyday stuff with “Royal Tour” or something similar printed on them. I’ve got a couple of examples. First is this short pencil (12cm, 4 ¾’’) that has a jewelled crown on top. You twist the tip to propel the lead. Printed on the body in gold is a small crown and ‘H.M. Queen Elizabeth II, New Zealand 1953-54”. This pencils not in good shape. The printing has faded or rubbed off, the plating is all brassed, etc. Just in case you are confused by the title, “Queen of New Zealand”, thinking she is Queen of England or something similar, well yes she is, but the various countries that she is Queen of all have their own separate legislation such that she is their Queen independently of the others. Thus she is Queen of Australia, Queen of The Bahamas, Queen of Canada, etc all as separate independent titles. I believe that things are all aligned these days, but back in the 1980’s I recall reading that some countries had human rights and other anti-discrimination legislation such that theoretically the laws of succession were a little bit tricky. However since The Queens oldest child is a male and his oldest child is a male there’s no problem, but if her oldest child had been a daughter, and Elizabeth passed on back in the 1980’s, then some countries could possibly have recognised the daughter as the new monarch and others would have recognised the son as monarch….complicated. I also have this great three colour pencil, by Everite, and it’s in “as new” condition. It really is a big pencil, as you can see by comparison to the Dixon Ticonderoga Black wooden pencil. A veritable super-size me whopper, some 20cm (8 inches) long. There is a little crown on top and “N.Z. Royal Tour 1953-54” is printed on the body. Like the others you twist the tip to advance the lead. The really neat thing about this pencil is that the three sections unscrew to become three separate little pencils, each with a different coloured lead – graphite in the white one, blue in the blue and red in the red one. Awesome. 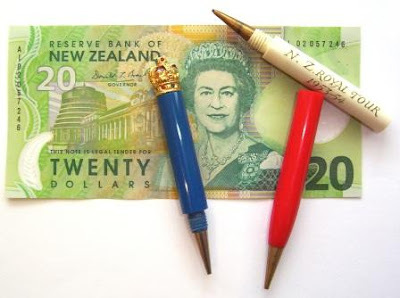 Trivia: If you have really good eyesight, you will see that on the $20 note in the photo above, the signature to the left of Her Majesty is that of Donald T Brash, Governor of the Reserve Bank of New Zealand. Dr Brash was the respected Governor of the Reserve Bank from 1988 to 2002, serving under Governments from both sides of the political fence. In 2002 he resigned and ran for Parliament as a National Party candidate. Then followed a meteoric rise through the ranks and he became the leader of the National Party, which narrowly lost our recent elections. So, the currency of New Zealand is guaranteed by the Leader of The Opposition! There can’t be too many countries that can make that claim. Personal Trivia: Now even though I’ve written this posting about the Royal Tour, I’m not really a Monarchist. I guess I’m fairly “neutral”, like most New Zealanders. I wasn’t around for the 53 tour but I asked my parents if they went to any of the parades or events for Her Majesty. They weren’t able to make it to the parades, but recalled that it was a very big event at the time, and told me how beneficial the tour was for our family. At the time, my father’s father was the maintenance manager for a small hotel chain and Her Majesty was going to stay at one of the company’s hotels. The tour was of course the very first time a monarch had ever come to New Zealand, and no expense would be spared, the hotel had to be totally redecorated. It had actually only just been redecorated a few months previously, but everything had to be ripped out and replaced so it was totally brand new for the Queen. At the time my father and mother were newly-weds and struggling to build a house in their spare time. There were still some post-war restrictions in place, and many building materials were in short supply. So many as-new carpets and fittings removed from that recently redecorated hotel ended up in our house, and in particular we got a brand new “throne” for the smallest room in the house. Porcelain fit for Royalty! ON HOLD. I wish you all well for the holiday season, and trust that next year will find you happy, healthy and wise. This blog will be on hold for the summer holidays. I will think of those of you who are having a ‘White Christmas’ with snow, as we fry up Christmas lunch on the BBQ and sink a few cold beers down here in the southern summer. Also spare a thought for our Australian cousins across the other side of the Tasman Sea. The bush fires are so bad that New Zealand fire-fighters are having to go over and help out. Footnote: I actually prepared this posting a few weeks ago, and just to stuff up my trivia, Dr Brash has since resigned from politics. Caught in a bit of a scandal. A little while ago in my posting on my 1948 Autopoint catalogue, I mentioned that Autopoint pencils were quite rare here in NZ. As with so many other things, once I mention it on my blog a coincidence occurs. I recently bought a mixed lot of old mechanical pencils at a local auction, and one of them was an Autopoint, so I now own an old Autopoint. I’ve had a quick look in a couple of catalogues and can’t really find that exact model. Lots of similar ones, but the pocket clip is different. It is not in very good condition. It's imprinted “SEALECT” on the 10-sided olive green plastic body, but the printing has mostly worn off. The metal eraser ferrule is cracked, but engraved “AUTOPOINT, PATD AND PATS PEND, MADE IN CHICAGO USA”. The eraser has hardened as you would expect, but it’s got a really nice sheen and finish to it, almost like polished leather! Quite nice really. Pity about the rest of the pencil. In their modern offering I guess the ‘All-American’ is the successor to this old pencil. Well, the end of year wind down is on. This is my second to last post for the year - December 23 will be the final post for the year. “That’s a pretty strange looking pencil” was the first thing I thought when I saw the Pentel Graphgear 1000. Actually its almost a little bit science fiction sort of looking with that metallic body, big clip and grip section. So first off, how does that grip section feel? It’s a fine diamond cut surface with little elliptical rubber inserts. Obviously this is an attempt to try and get the best of both worlds, and I’m pleased to say it’s reasonably successful. It doesn’t feel like an ordinary rubber grip, yet still has a bit of softness about it when you are holding the pencil. Then there is that massive pocket clip. Actually they call it a document clip, a reference to how you can clip it to a thick sheaf of papers. It is a powerful spring loaded clip that will grasp about 15 sheets. Pentel advertise this pencil in their drafting section rather than general section. To me the document clip implies a general office or writing type pencil, but the name, the look and the features are very draughting or graphic art orientated, so perhaps they are aiming for a sort of cross-over pencil; general office and technical work? This is a vanishing point type pencil, with a push top ratchet lead advance mechanism. Similar to a ballpoint pen, pushing the top button first pushes out the tip section with its 4mm lead sleeve. Further operation of the top button advances the lead like a normal push top ratchet pencil. The mechanism only advances a very short length of lead each time. Once out, the sleeve is a fixed sleeve, but operating the document clip automatically retracts the tip section for pocket safety and to stop the sleeve getting bent as it’s carried around. It’s a very serious ‘wham slam’ spring loaded retraction system! Actually I wasn’t totally happy with this vanishing point mechanism. There is a very slight amount of movement in it, and particularly when you first start to write I felt like it was catching on the paper with the first tiny little wobble. Also with the tip extended, the grip is a fair way back along the pencil so it might not suit those who like to hold their pencil right down close to the tip. There is a small eraser under the top button. I suppose it’s better than nothing, but not that much. Occasional use only! There is a lead hardness degree indicator just at the top of the grip section. You can select to display 2B through to 2H. You have to unscrew the very front of the tip section just a little, which loosens the grip section so you can rotate it around to show the desired hardness grade in the window. My Graphgear 1000 is 0.5mm, but there are also 0.3, 0.7 and 0.9mm options, distinguished by different coloured rubber inserts in the grip section. The main section of the body is aluminium tube, but it’s got an unusual roughened but shiny surface finish. Printed in black on the body is “GRAPHGEAR 1000 Pentel PG1015 Japan 6C .5” so you get the full story! Overall I would say this mechanical pencil is built to last, to give you many years of solid reliable performance, but I’m not sure I would recommend it as a general writing pencil. I think it’s more suited to being a technical pencil that also does a bit of general office work. Best Points – The vanishing point, the unusual looks and the document clip if you are the type who likes to clip your pencil to a folder of notes as you walk to a meeting. Not So Good Points – The very short lead advance is a bit annoying when you have a lot of writing to do. Price Range – Low / Mid. Dimensions – Length 150mm, diameter 10mm at grip section. Balance point about 80mm up from the tip. Yes, yes, alright! Too much time spent playing with kids watching 'Ses*me Street'. Well…if you guessed these two, then you’re absolutely right! 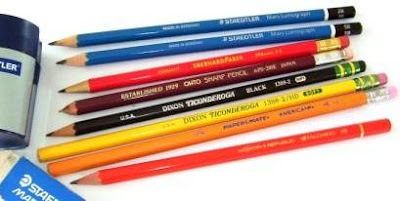 Mechanical pencils that look like normal pencils. Mechanical pencils that look like wood pencils. Seems some folk want the best of both worlds – the traditional wooden pencil look with the advantages of a mechanical pencil. Well here are two that I have. When you hold the Ohto APS-280E in your hand it really feels like a wooden pencil. That’s because it is! Yes, it’s an ordinary hexagonal wooden pencil, with the core drilled out and a mechanical pencil mechanism put in. The only real giveaway is the small brass metal tip / lead-sleeve. It’s quite a nice rather unusual experience to write with this pencil. The look, feel, weight and balance of a good quality, lacquer finished wooden pencil in your hand, but the smooth fine writing of a 0.5mm polymer lead. Great stuff. Now the lead in this pencil is not your ordinary 60mm long mechanical pencil lead, its double length at 120mm. Personally I’ve only seen cheap Chinese 120mm leads for sale, and I wouldn’t waste my money on them. No matter what price you paid, you paid too much. But luckily you can just put an ordinary 60mm lead down the tube and happily start clicking away. Just to clarify, like most normal push-top ratchet mechanism mechanical pencils you just pull the eraser off the top and stick a lead down the tube. The tube is really quite thin, so it’s pretty much just one piece of lead at a time, no reserve storage. The mechanism is a standard push top ratchet lead advance system. The metal tip is not retractable, and there’s no pocket clip, just like with an ordinary wooden pencil. The eraser is again an ordinary sort of wooden pencil pink rubber compound eraser. It erases reasonably well, but as usual I’d prefer a vinyl compound eraser. The eraser is mounted in a metal holder which in turn push fits into the ferrule housing. I guess you can buy replacement erasers complete with metal holder. Now this is one thing against the Ohto - the metal eraser holder rattles inside the metal ferrule as you write or wave the pencil about. I actually found this really annoying. I suppose it would be a simple thing to put a little piece of paper or something inside the ferrule to wedge it all tight and stop the rattle. So overall, aside from the rattle bit, I’m pretty impressed with this pencil. It was great to write with for a few days, but it’s a little thin for my personal taste. Best Points – It really feels and looks like a wooden pencil. Just ignore that metal tip! Not So Good Points – The rattle, and no spare lead capacity. Dimensions – Just like an ordinary wooden pencil. At first glance the EFAmatic looks like a wooden pencil, but then you quickly pick up on the fact that it’s actually plastic. Well, apart from the metal eraser ferrule of course. So, nice shiny ferrule, shiny red body, gold lettering, all in all it’s a good look. There are two things though that I’m not totally keen on. The first is the beige colour of the tip. It’s supposed to be like a sharpened wooden pencil but it doesn’t quite work. The second is the barcode. It’s very clear and prominent, much more so than on most wooden pencils and I think it looks a bit ugly on this pencil. Now the EFAmatic is a hex shaped pencil, just like the wooden ones it’s trying to imitate. The grip is reasonable despite there not being any grip enhancements. It has a reddish rubber eraser in a metal ferrule on the end. The eraser is a rubber compound, and works reasonably well. I guess you have to buy full new ferrule sections if you want to replace the eraser. Like the Ohto, this pencil uses the long 120mm leads. There is a 0.5mm and a 0.7mm variant. You pull the whole ferrule section off to refill the lead. Like the Ohto, you can only have one stick of lead in it at a time, but you can get away with refilling it with two 60mm sticks of lead. You have to use two though, as the rod on the ferrule section pushes the second stick of lead onto the first and starts it into the auto-advance mechanism. Yes, that’s right, it’s an auto-advancer, not a push-top ratchet. There is no manual mechanism to activate the lead advance. You just write and the lead advances. It writes quite smoothly; with very little ‘scrape-through’ as you go over existing lines or letters. I guess this particular plastic tip is better at this than most others I have tried. However, there is still the dreaded “plunging”. Certainly not as bad as some others, but it still happens from time to time. It really is annoying. You are writing away and suddenly the pencil just plunges forward as the lead advance mechanism activates in a particular way. Putting the occasional plunge aside though, this auto-advance system works quite well. No pencil sharpener required here! If you are like me and sometimes can’t resist flicking the tip with your fingernail to make the lead advance there is no way of getting it to go back in. Also of course there is no pocket clip or retracting tip for pocket safety. But let’s not be picky. Overall, for the price, this is a pretty good pencil. Best Points – The looks and the price. Trivia: For some reason I thought that all the various “Faber” companies were now back under the Faber-Castell umbrella, but I looked at the Eberhard Faber website and immediately thought, “Those pencils look like Staedtlers!” I was right, because a few more page views lead me to the company profile which states, “In 1978 the company was taken over by Staedtler-Mars/Nuremburg”. The Final Bit: If I could only have one or the other, I think I would choose the Ohto, because it really is wood. 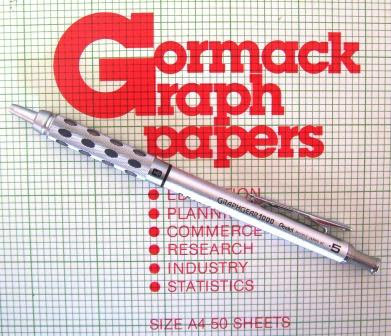 But the EFAmatic is a good pencil too.